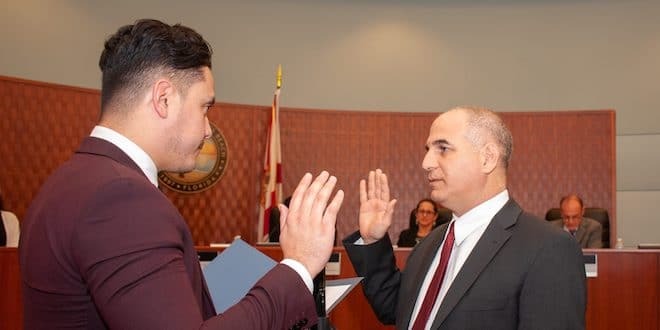 (Thursday, January 24, 2019) – I am very thankful and happy to be able to serve our community. I have been living in Sunny Isles Beach for over 30 years and have a lot of family members in this city. This city is very dear to me as I have spent the majority of my life here and it’s the city where I grew to become an adult. I graduated high school from North Miami Beach Senior High and then attended Florida International University where I majored in advertising and minored in marketing. I now have a family of my own and my main goal is to be able to continue living in a city that has a great standard of living and where residents of all age groups enjoy a high quality of services. My professional experience is in media and advertising. I have been fortunate to work for some of the major media and telecommunications companies in the world where I gained great knowledge managing national and international markets. As your commissioner, I will work hard and apply my experience in advertising and media research as well as the knowledge I’ve gained as a member of the City Advisory Committee (CAC) for the benefit of the community. I will ensure that we continue to live in a city that provides its residents with exceptional amenities, services and safety. Please feel free to contact me at alama@sibfl.net or 305.792.1752.